While many Star Wars fans might want to argue, the simple fact is that the single most successful licensing brand of all time is Star Trek. With 5 television shows with a combined number of seasons over 25 years, 10 feature feature films, a cartoon, hundreds of books, and now action figures produced by not one or two but at least 5 different companies (I'm sure I'm forgetting one), it's impossible to argue with their success. The license for the action figures has moved on to Art Asylum, and is clearly their biggest license to date. 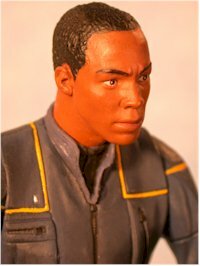 Previously only working on a few figures in any one license such as Crouching Tiger, Hidden Dragon, this endeavor will cover several years, and both the new movie Nemesis along with the current TV show, Enterprise. 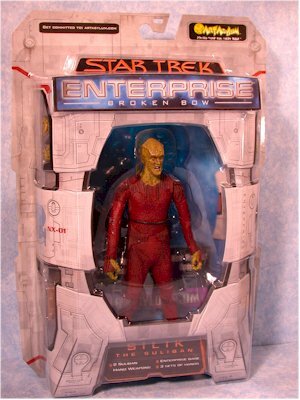 The first set of figures released are based on the episode Broken Bow. This pilot episode set up the background for the first season of the show. There are six figures in the set - Captain Archer, the Klingon warrior Klaang, Sub Commander T'Pol, Lieutenant Reed, Ensign Mayweather, and the Suliban alien Silik. Each retails for about $8, and are showing up at Target first. The packaging is sturdy, is eye catching, and has fairly descriptive and useful text. The nicest touch is the ability to see all the accessories easily. Gentle Giant did the work on these, using Real Scan. The results, as is often the case with Real Scan, vary greatly. Klaang, Archer and T'Pol are the winners in this category. 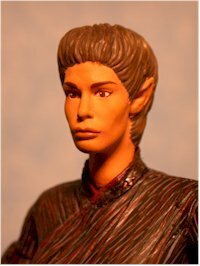 T'Pol is really the closest to perfection, and it looks extremely good. Unfortunately, her body sculpt isn't nearly as good as her head, and her pelvis has an odd position, along with a truly funky bend in her right forearm. Likewise, Klaang and Archer have their minor issues. 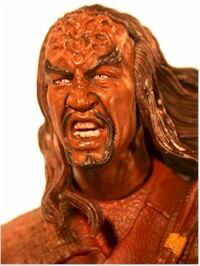 Klaang is the closest in overall sculpt to perfection, but I don't like the 'action pose' they decided to give his hair. 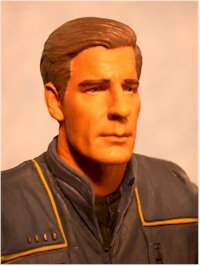 Archer has a great overall body sculpt, and it really does look like Scott Bakula - except the nose. Now I'll be happy to admit that Bakula has a big nose - having one myself, it's always nice to see a big-nosed leading man - but he's not Jimmy Durante. The Real Scan snoze came out huge. The other three are all below these in quality. Mayweather isn't awful, although comparing him to the photo he ends up looking a bit more generic than the character really is. Reed falls a little lower on the scale, due to his having a bad hair day on his visit to Gentle Giant. The left side is flatter than the right, and while I appreciate that might be close to reality, I prefer a little symmetry in my action figures, at least the humans. Silik rounds out the set as bad. That's unfortunate, since he's a very cool alien. They did a wonderful job on the detail, but the detail on Fozzie Bear is great too - but he's not a Silik. 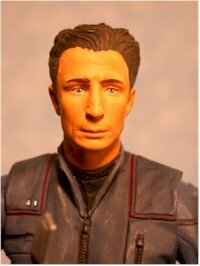 The nose on this figure is just awful in comparison to the source material, and they added a terrible mouth sculpt. 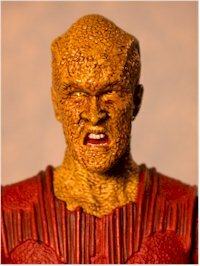 Look at the closeup at the very top of the screen and tell me, in complete honesty, that he doesn't look like Beavis with a bad case of dermatitis. The paint ops don't vary quite as much as the sculpting. Klaang is a standout though due to the greater complexity of the work on his uniform and face. I also put T'Pol at the top, as she had the nicest, cleanest and most attractive face paint of the set. Archer, Reed and Mayweather are all very well done though, and only fall behind due to the slightly less complex paint ops. Poor Silik pulls in behind again, this time due to terrible eyes on the four I've seen so far. Everyone has had crossed eyes, and it seems very odd considering that the eyes on all the other figures have been well done. Poor Silik. He just can't catch a break. In general, these figures have a great ball jointed neck, ball jointed shoulders, cut biceps, elbows, wrists, waist, thighs, knees and ankles. I think they may have cut thighs as well, but some work and others feel stuck. Some have slightly better ankle articulation than others, but overall these figures are extremely well articulated. To hide many of the body joints, like the hips and waist, the uniforms are made of a soft rubber in these areas, similar to what we first saw with Crouching Tiger, Hidden Dragon. This works fairly well, although they way it bunches up around the thighs and stomach when they are sitting is sure to cause some complaints. Some folks have had troubles with the rubber pieces lining up well with the rest of the lines of the body (zippers, creases, etc.) but there was no problem with any of the figures I picked up. The only real issue I see is whether these will last very long. Many people have reported problems with some of the Sleepy Hollow and CT, HD figures where soft rubber was used, and a few months later began to break down and degrade. Only time will tell if that becomes an issue here. So why did poor Silik get beat up again? Because for some reason that is entirely unclear, he has no elbow joints. Not only that, but his arms are a rubbery material, rather than hard plastic. What was the thought behind such a terrible design move? It really hurts what could have been at least a decent figure otherwise. Accessories bring another mixed bag. 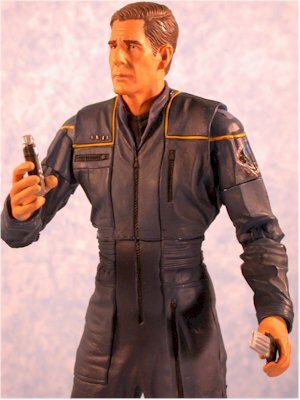 Every figure comes with a couple standard items - extra hands, and an 'Enterprise' stand. The stands are nice, but nothing exciting. There's no peg holes in the feet, or pegs on the stands, and the figures don't really require them, so I could actually be happier with out. Some of the figures have more sets of hands than other, but I noticed a big problem on more than one figure - the extra hands are identical to the ones they already have! 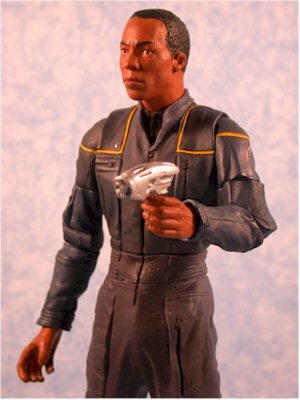 Mayweather is the worst in this situation, since both pairs of hands are identical, and his only other accessories are the phaser, tricorder and communicator that are reused across the line. Archer is outfitted in the same way as Mayweather, but at least his second set of hands was different than the first. 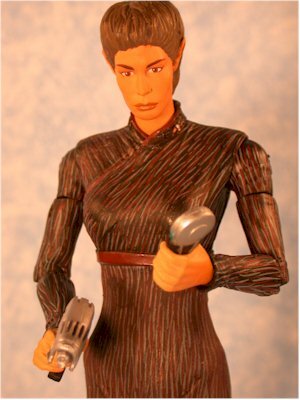 T'Pol has three extra hands, the same phaser and communicator, but her own special scanner. 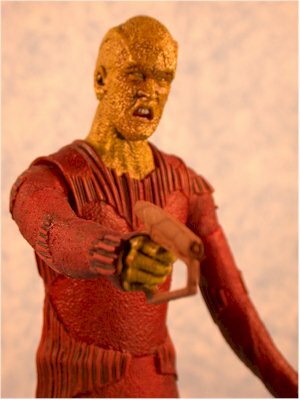 Silik comes with two of his Suliban phasers, and four - count them four! extra hands. But again, of these four hands, one of the extra lefts is identical to his original left. Reed had the opportunity to stand out, with a terrific carrying case, but his extra left hand matches the original again, and the case simply carries two more of the same identical phasers. 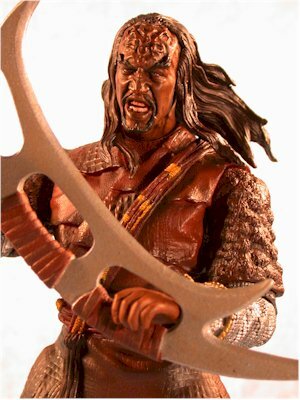 Klaang is the winner in the accessories contest, with an extra set of hands (again, one of them is identical to the original), knife, Klingon phaser, and well sculpted 'sword of honor'. I'm not a big fan of extra hands - maybe one set, but three or four hands? At least Art Asylum has greatly improved the pegs and holes used with these, and you won't have as much trouble removing them and replacing them as you may have had with CT, HD. At eight bucks each, they are right about where you'd expect. But if you end up paying $10 or more through a comic shop or on-line retailer, you're reaching into a range that's simply too much for this much accessory reuse. I ended up picking up all six, but if I had to do it over I would have completely skipped Silik, and thought long and hard about Reed and Mayweather. 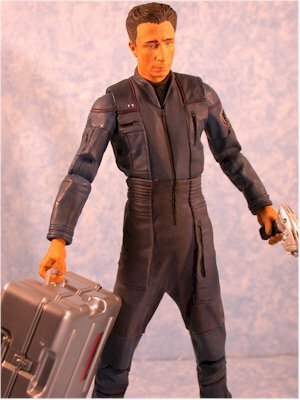 The three figures to pick up are Archer, T'Pol and Klaang, and only the serious Enterprise fan needs to complete the set. It's not that they are terrible - the articulation is great, and the sculpting above average for the most part. But there's lots of accessory reuse, some of the sculpts are certainly worse than the others, and the duplicate hands is a serious problem. Hopefully it's just a QA issue, and they really didn't think you wanted extras of the exact same hands. - Best price on the web is at New Force Comics, where you can get an opener set for $45 plus shipping. - Comics Infinity has the set of 6 for just under $60 plus shipping.